(1) Debate and discussion should be civil. MadWeather does not accept anonymous posts. The digging short wave at 500 mb and the strong push of cold air down the Front Range, and also south across the Great Basin, combine to produce a significant wind event for much of the Southwest. At leastthis is the case in this morning's forecasts from Atmo's WRF-GFS model. I'm showing several different forecasts here to convey the extent and variability of the forecast event. 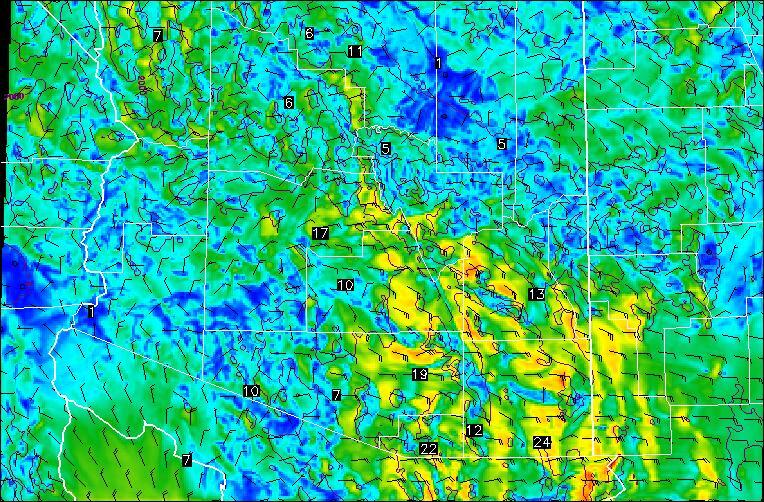 The panel above is the 1.8 km grid, 10-m wind forecast valid at 11 pm MST tomorrow night (May 1st). At that time the forecast indicates strongest winds across the northwestern third of the 1.8 km domain. But the front is also intruding into the eastern domain over New Mexico. Below is the forecast for 8 am MST on the 2nd across the 5.4 km domain. 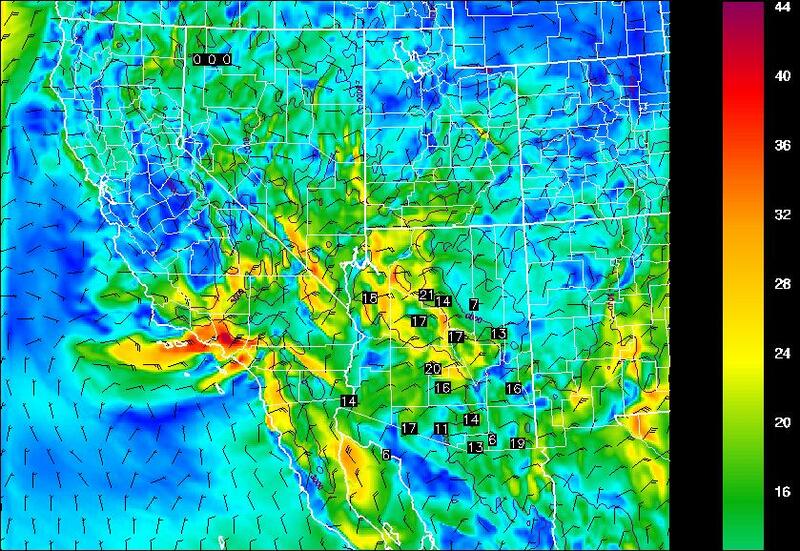 The 10-m winds are now forecast to be strongest over the northern LA Basin, in a kind of Santa Ana wind pattern. 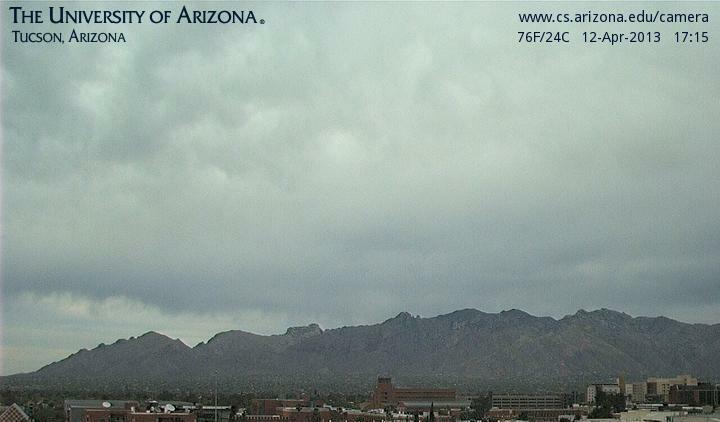 Stronger winds are also moving into southeastern Arizona from the east. 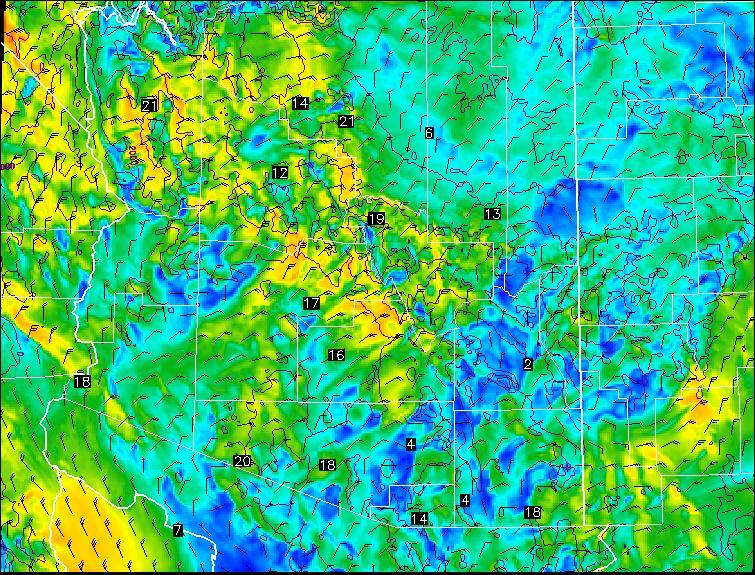 Forecast above is also valid at 8 am, but on the 1.8 km grid and is shown for comparison; note the nasty winds over the northern Gulf of California. Below is the 1.8 km grid forecast valid at 11 pm on the 2nd, when the model forecasts the strongest winds across southeastern Arizona. The WRF-GFS model forecasts a complex and rapidly evolving wind event that will impact much of the Southwest Tuesday night and Wednesday -something to watch as it evolves during the coming two days. Above is graphic from NWS, produced yesterday, indicating forecast high temperatures for southeast Arizona. Tucson did indeed reach 95F yesterday afternoon, and it seemed hot to me during the mid-afternoon. The forecast Saturday morning had outlooked 100F for TUS today, tomorrow and Wednesday, but latest forecasts have backed off some on the highs. So, it looks like first 100 F day will probably come later in May. April will close out with only 0.22" of rain here at house on the 8th. It has remained very dry, with RH during the past week reaching into 20% during early morning hours and afternoons dropping to single digits. This, of course will continue through much of May and June, the months that bring our hottest and driest time of the year. Off topic again - just so many things begging for comments this week. 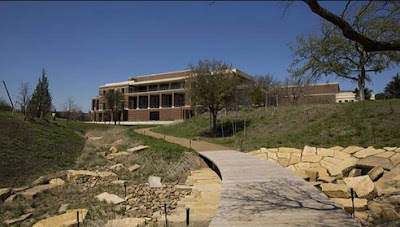 It seems ironic that the least literary of our Presidents has built the largest library of all Presidential Libraries. It is on the campus of SMU in Dallas, Texas. The grounds cover 23 acres and include hundreds of trees and shrubs. Molly Ivins would be pleased! 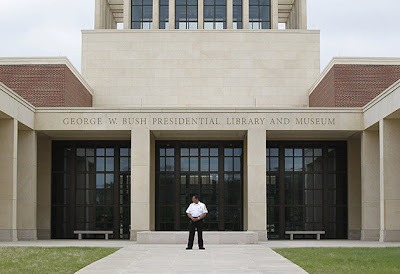 Entrance to museum and library is shown above with an armed guard in place. A few facts highlighted in the news this week. The new W library will house 80 terabytes of digital data - thus, explaining why the facility had to be so large. It is possible that the number of real, old fashioned books eventually may exceed 100. It is the first LEED certified Presidential Library - seems ironic for such an environmentally hostile administration (grounds are shown below). It is rumored that when serious trimming efforts are needed on the grounds that Bush will drive his huge pickup, with chain saw, up to SMU. Some pundits are now speculating that W was really a closet greenie. There are now 13 Presidential Libraries. 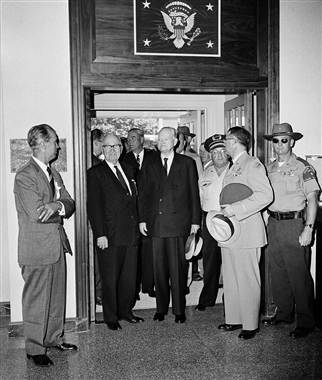 Least popular last year (ranked as per number of visitors) was that of Herbert Hoover (below - located in Westbranch, Iowa). The most popular was that of William Clinton in Little Rock, Arkansas. So it goes. 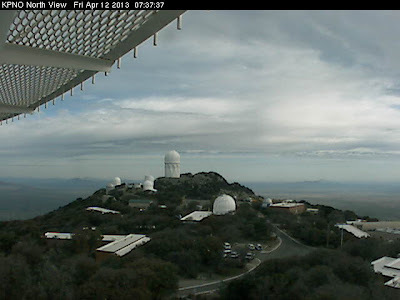 As May approaches, things will be heating up, and the Tucson NWS forecast this morning (Saturday 27 April) indicates high temperatures at the airport grid of 100 F on next Monday, Tuesday, and Wednesday. Last year the first 100 F day occurred on April 22nd and was the second earliest on record for Tucson. By May 1st the global models are forecasting another strong cold front plunging down the Front Range of the central and southern Rockies. I've shown the operational, 120-hour forecasts for 850 mb from 00 UTC last evening. Above is from the ECMWF and below is from the GFS. Both forecasts are quite similar, with the front nearing the Texas Big Bend country by 5 pm on May Day. The ECMWF appears to forecast a stronger temperature gradient with the front than does the GFS. Both models try to backdoor the front into southeastern Arizona on Thursday the 2nd - so something to watch as the new month begins. The weather in the Southwest continues mostly on Spring Break - although, it was a cool 45 F here at the house this morning. I will continue a bit off topic. I have tried to read the full NWS document that I referred to in yesterday's post: the 81-page W-R N Roadmap. However, this is a very difficult document to plow through. 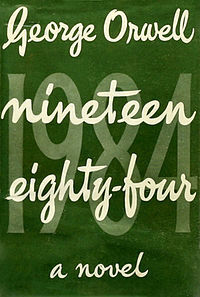 The writing seems to be in a variant of English, with numerous acronyms and phrases in psyco-babble or agency-speak. An example is shown below; Section 2.4.3 which discusses the planned "On Boarding" process of the NWS. 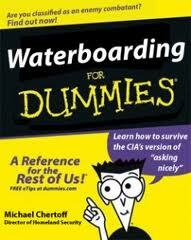 The first thing that popped into my mind when I read this was "water boarding." Probably not a relevant connection? 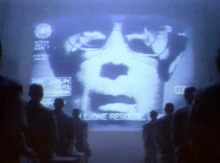 But, next I thought of George Orwell, 1984, indoctrination, The Manchurian Candidate, and the famous Apple Computer 1984 TV commercial. 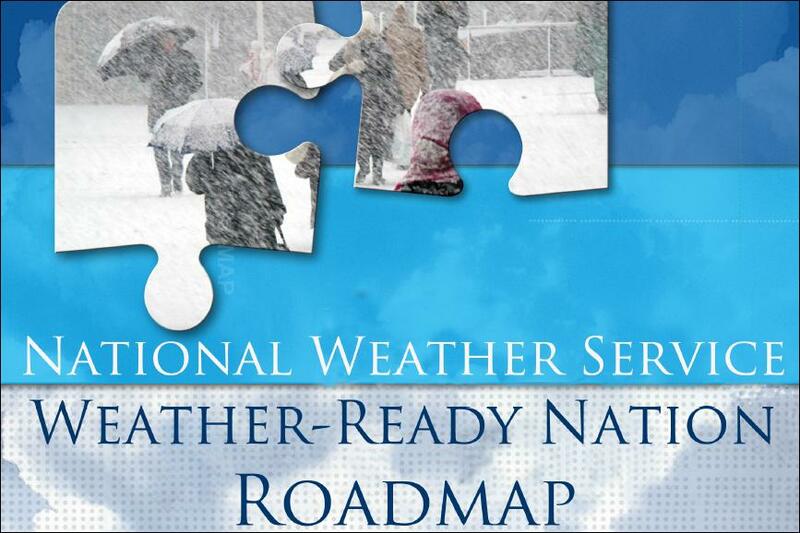 Very glad I don't work for the NWS (although I once did, but that was way before 1984). 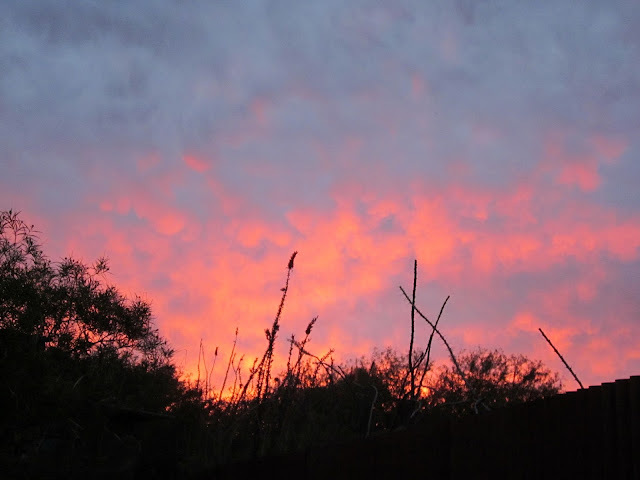 Nice, Blood Meridian type, sunset last evening. 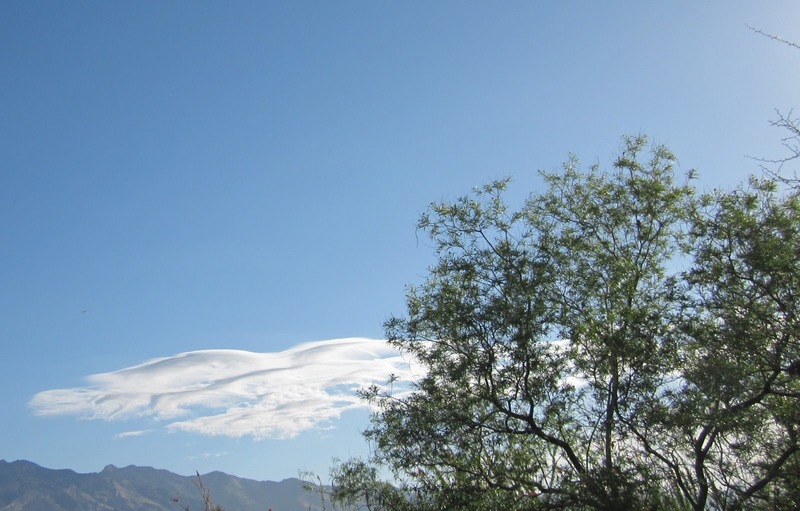 Couple of small lenticulars over the Catalinas this morning. 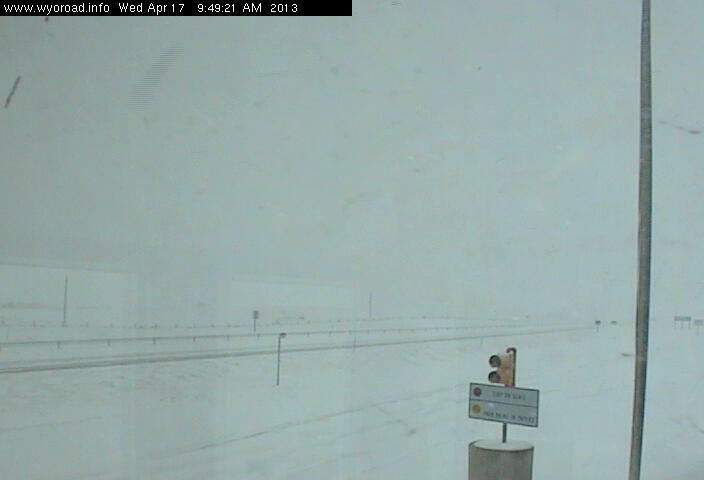 Since the weather continues so bland over the far Southwest, I'll probably be tempted to go off topic later today. Refer to previous post. 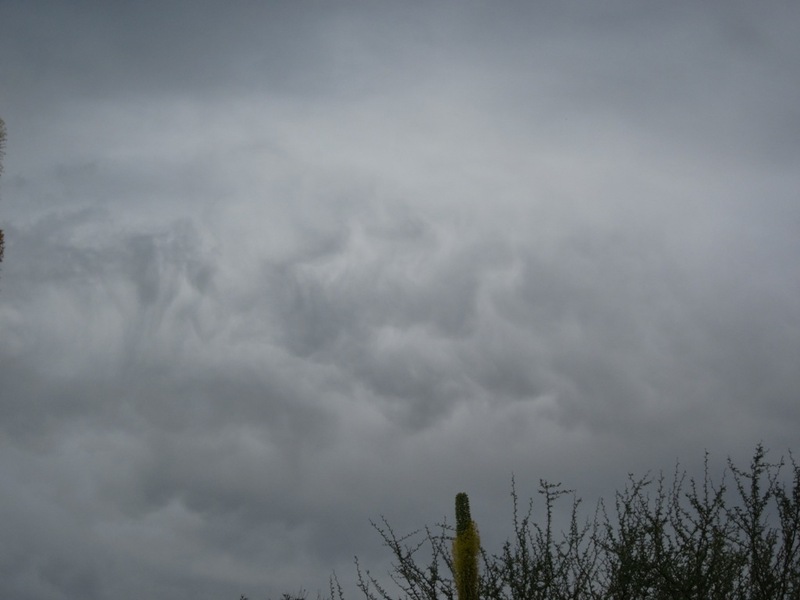 Above is photo of virga and mammatus nearly overhead - taken from here at house at about 5:30 pm MST. 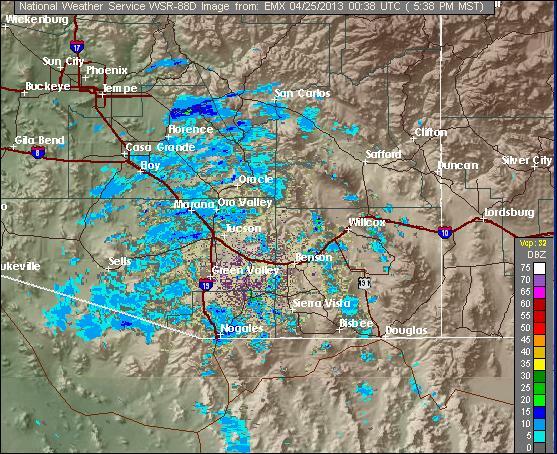 Below is NWS Tucson radar composite reflectivity at 5:38 pm MST. All very much like what was predicted by the early WRF-GFS, discussed below. The weak, cutoff low that has been meandering around the eastern Pacific at about 30 degrees north is going to come across the Southwest this afternoon through tomorrow. The water vapor image above (from 14 UTC this morning, 24 April 2013) indicates thickest, upper-level moisture is well ahead of the circulation, with a west-to-east band already present across southern Arizona. 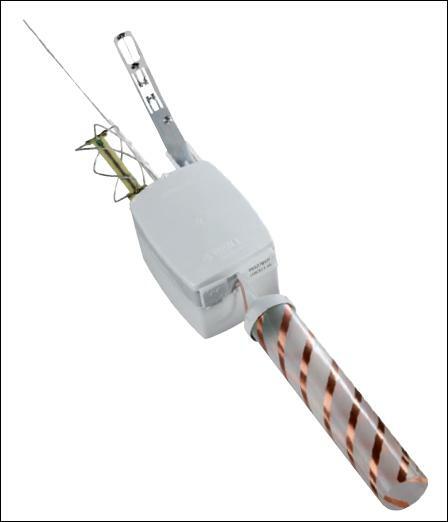 The blended PW product from CIMSS at Univ. of Wisconsin (below for 12 UTC this morning) indicates very little moisture with this system. 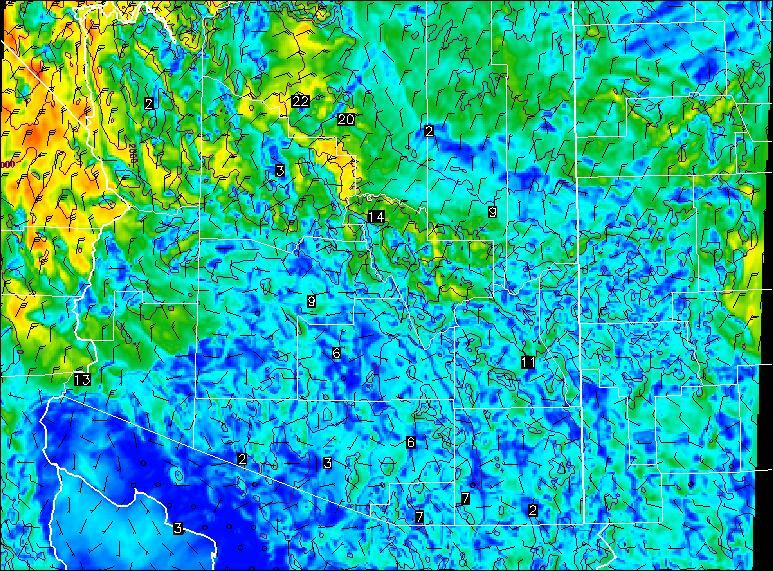 The early run of Atmo's WRF-GFS this morning indicates that most of the thicker, mid-high clouds will actually move across southern Arizona this afternoon and tonight. 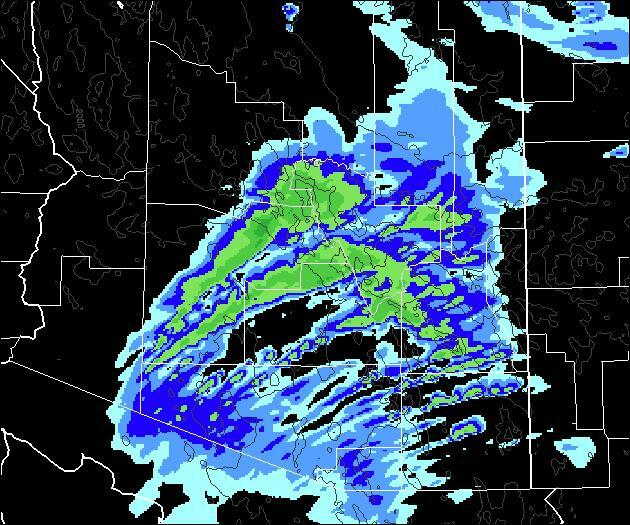 The above is forecast composite radar from the model valid at 6 pm MST this evening. Tomorrow the model keeps the radar echoes over the northern half of the state. 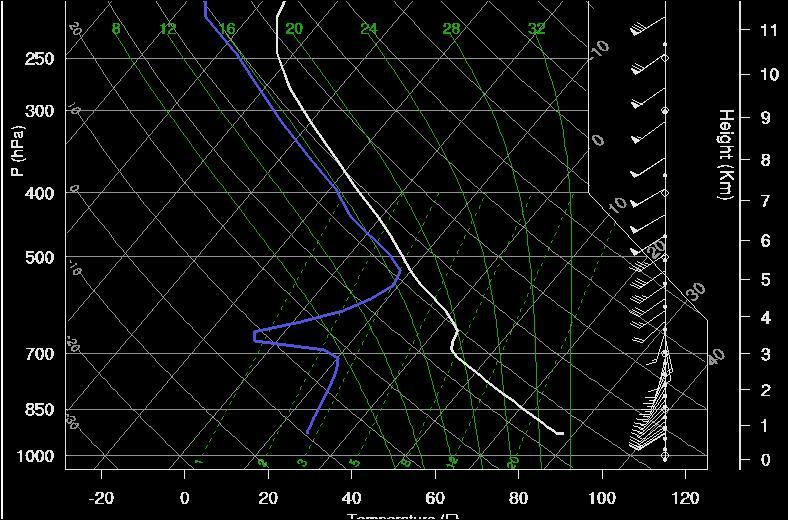 The forecast sounding for TUS (also valid at 6 pm today - below) indicates VERY dry air below about 520 mb with strong southwesterly winds. What moisture there is is confined to the upper-half of the troposphere. So, perhaps some virga and mammatus late in the day. The model forecasts no precipitation at the surface with this system, except for light sprinkles tonight and tomorrow over the northwestern quarter of the state - so the long dry spell continues (only 0.25" of rain here at the house since February 20th). Still looks great from a distance. 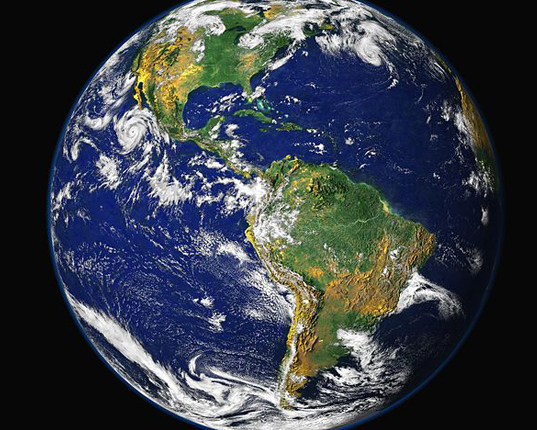 But our problems and future challenges show up easily at closer perspectives. Green Valley from closer in. Lake Mead from close-up. 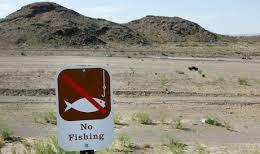 Water and the Southwest - the challenge of the century for our part of the country. 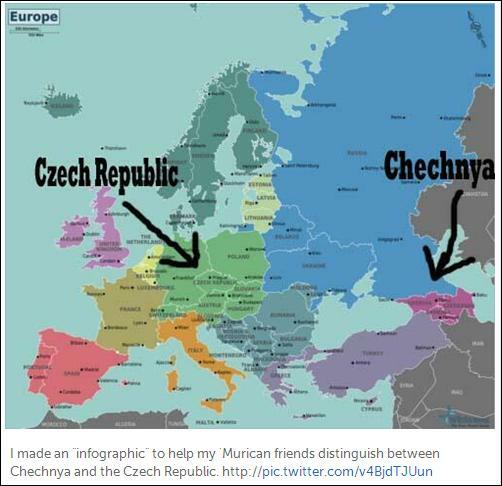 (CNN) -- Memo to tweeters: Chechnya is not the Czech Republic. That's the message from the Czech ambassador to the United States. As it emerged Friday that the family of the two suspects, Tamerlan and Dzhokar Tsarnaev, is originally from Chechnya, those unfamiliar with the restive Russian republic rushed to brush up their knowledge of the region. This morning's NAM model forecasts another plunge of cold air to rush down the Front Range of the Rockies on Monday and Tuesday next week. The 850 mb forecast valid at 12 UTC on Tuesday morning (above) shows the cold front just reaching the Big Bend country of Texas. Cold air at 850 mb is forecast to cover most of the northwest and north-central parts of the country, with the cold front west of the Rockies pushing south across the Great Basin. First - temperatures this morning (Friday 19 April) and yesterday morning were quite chilly here at the house. The low yesterday was 36F and this morning it was 35F. So, I expect that the farms along the San Pedro probably had two more mornings at or below freezing (the low yesterday was 28F at the Empire RAWS station) - see earlier post about winds and below freezing temperatures over at Sleeping Frog. 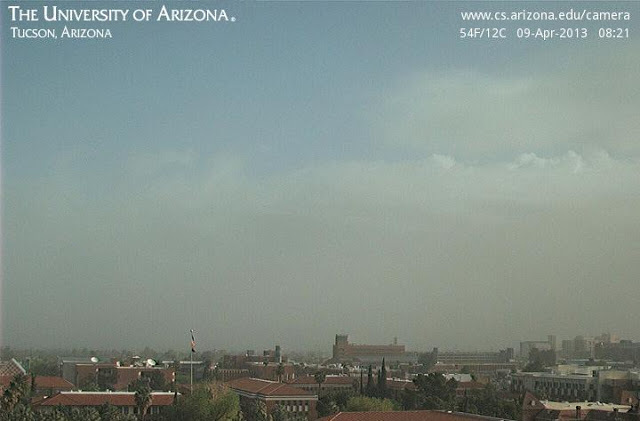 The photo above shows the ugly dust cloud that moved into the area early on Tuesday morning, the 9th of April. 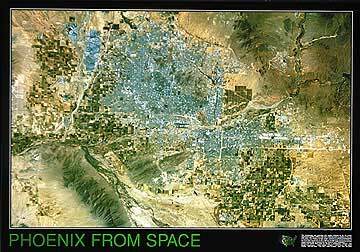 Mike Leuthold reported that satellite images seemed to indicate that the dust had come in all the way from the southern California deserts. Trajectories from Air Resources Lab HYSPLIT model also indicate that the low-level air over the greater Tucson area on Tuesday morning had indeed been over the California deserts 24-hours earlier, with the dust particles carried along by the strong winds and/or also picked up anywhere along the way. The particulate counts at some local monitoring stations far exceeded EPA guidelines during the morning hours. 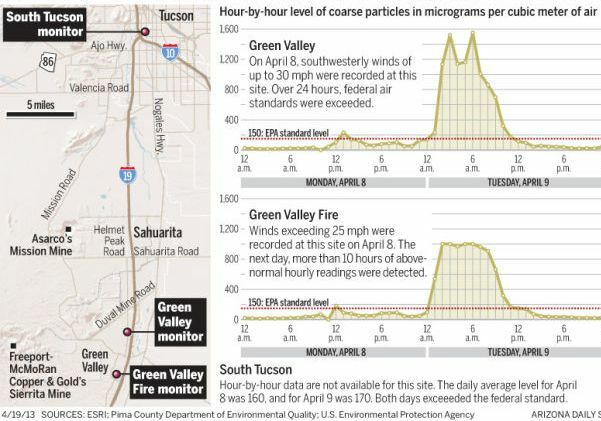 The data and information below are from the morning article about the poor air quality that was in the Tucson Star. Visible satellite image (above at 8 am) shows some post-frontal cloudiness over eastern Pima County. 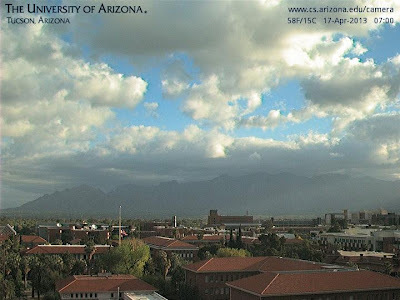 View of Catalinas an hour earlier (below) shows mountain tops in the cloud this morning. Bottom image is I-25 at the Colorado-Wyoming border this morning, as winter continues continues over parts of Front Range and Plains. Heavy snow bands along the northern Front Range are getting a lot of weather chatter this afternoon. 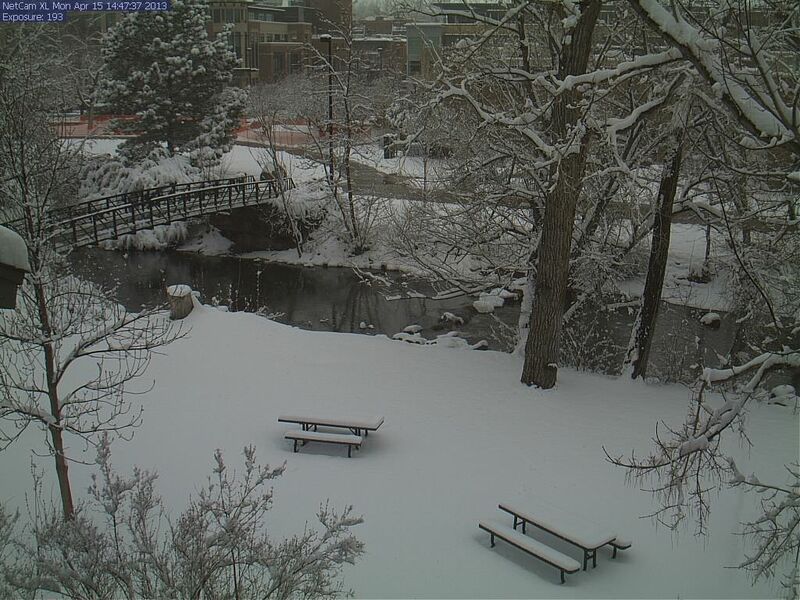 Snow seems to falling heavily at I-76 and I-25 (above), while the scene along Boulder Creek below is picturesque. Was a very nice day here today (Sunday 14 April), although a bit windy this afternoon. Following shots of back yard taken this morning show that it's a colorful time of year - mostly yellow and green, but with a bit of hard to see red. The folks at Sleeping Frog Farm (see "A" above) report in their morning, online newsletter that during the past week: Spring is here! 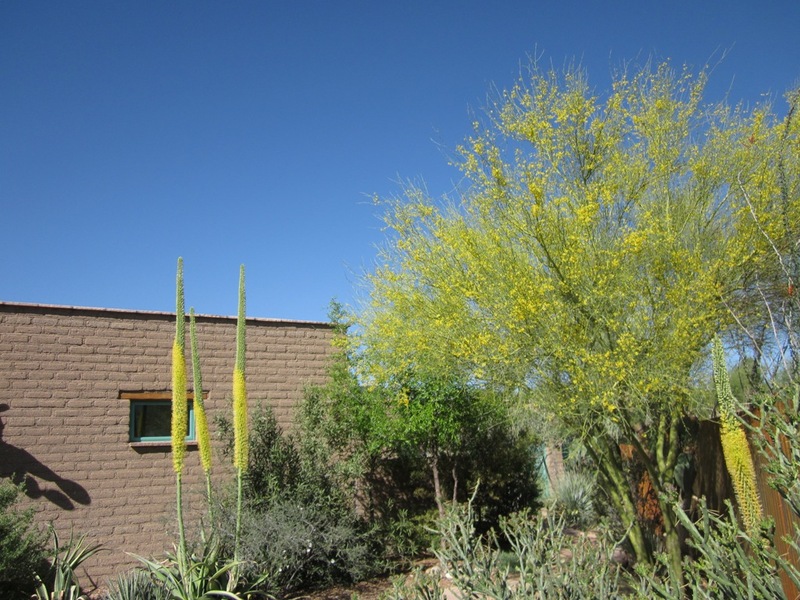 The cottonwoods along the San Pedro River are a beautiful emerald green, and the mesquites have begun leafing out as well. Spring means better growing conditions, but also brings its own set of challenges. This region is notorious for damaging Spring winds, and true to form, they’ve picked up considerably this week. On Monday, this valley recorded 70-80 mph gusts [60 to 70 kt], which tore the cover off of one of our production hoophouses and ripped holes in at least four of our other hoophouse doors. And even though Spring brings much kinder temperatures, we still hit 28 degrees a few nights ago. 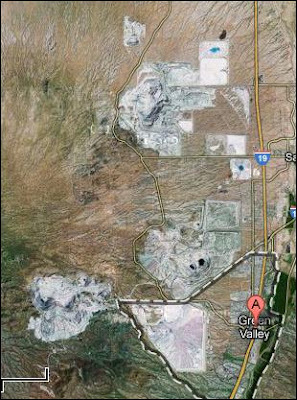 The farm is in the San Pedro Valley north of Benson, and directly east of the Rincon Mountains (max elevations just below 10, ft MSL) - see map above. 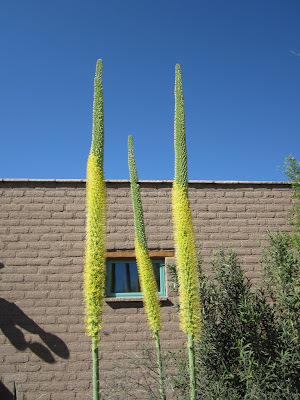 The high winds occurred on Monday (8 April) afternoon or evening. A Tucson sounding from 6 pm Monday evening is shown below - NWS apparently had trouble launching in the strong wind conditions, so their sounding was delayed. The data indicate possible winds near mountain-top level were 40 to 50 kt, and the El Paso sounding the next morning had winds of 70 kt near 700 mb . 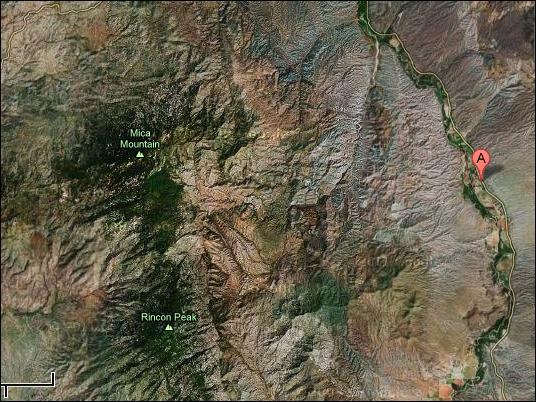 So, it is possible that mountain wave-amplified winds occurred locally in the San Pedro Valley. The below freezing temperature of 28 F probably occurred Thursday morning (possibly Wednesday morning) behind the cold front, after winds went calm in the valley during the night. Another 500 mb short wave will be crossing Arizona late Tuesday and Wednesday of next week. The 120-hour, 500 mb forecasts from the operational versions of the ECMWF (above) and the GFS (below) are shown - valid 5 pm MST on Tuesday afternoon. The forecasts are very similar, with the ECMWF taking a bit larger vorticity maximum across central and southern Arizona, while the GFS keeps this maxima across central Arizona. At this time, assuming the forecasts verify well, it appears like another windy Pacific front across the area, but with both models keeping the system starved for moisture. The GFS keeps much of the Southwest, most of California, and western Mexico completely precipitation free for the next ten days - see below - forecast of total precipitation for that period. Ugh. Updated to add: Thick clouds with some virga and periods with mammatus hung in here at the house all day, which was quite a dreary day. Below is 5:15 pm MST look at the Catalinas. A weak middle and upper-level short wave is moving across northern Mexico this morning - see 7 am MST water vapor image above. Skies are mostly cloudy with high and some middle clouds, and even some high level virga. Image below is north view from Kitt Peak about 7:30 am. 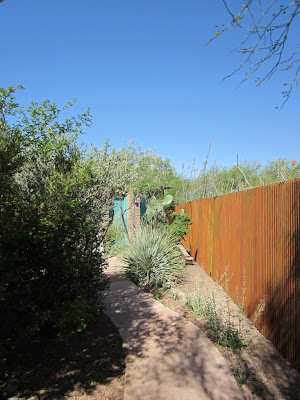 So, a bit of a change from last couple of days - the clear skies of the last two mornings resulted in low temperatures here at house of 39F on Wednesday and 40F yesterday.